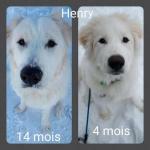 Here is LuAnna's Great Pyrenees Rescue story. LuAnna came to us from Quebec and was rescued from a puppy mill farm. She was approximately 1 – 1.5 years old. She was extremely gaunt when we took her in weighing only 50 pounds, but had gained nearly 30 pounds in the few weeks she had been with us. She was still thin and needed love and good food to fatten her up. That was not to be a problem, as she always seemed to be hungry. A vet cleared her so she is in good health. She has been spayed. 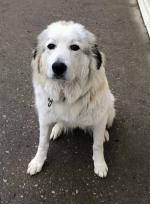 LuAnna is a very outgoing and loving Pyr. She is great with people and readily takes all the attention that you want to give her. She also gets along very well with other dogs. LuAnna however hates squirrels on her property. It seems that this is her mission in life to protect her territory from those dreadful squirrels. She will sit and wait patiently for one to come down from the trees and then immediately chase it. We knew that LuAnna would be a great pet. Like so many Great Pyrenees Rescue dogs, her tragic early life did not seem to have soured her on life or people. We knew she would thrive once placed in a good home. So how did this dog adoption story conclude? LuAnna has a new home, a new brother and a new name – Freya. Freya has found a home in Nova Scotia’s south shore, about 30 minutes outside Halifax. 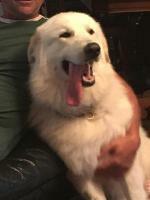 She has an older brother- a neutered male Pyr about 3 years old. 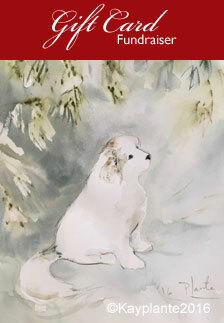 Her new owners are positively enchanted by her and say that they had no idea Pyrs could be so different in temperament. Her brother is laid back, a plodder and not that interested in people or many things. He normally plods along on his walks and is content to watch the world go by. Freya has other ideas. She has met all of her neighbours and is a favourite already with her outgoing personality. She has endless energy and drags him along with her as she explores everywhere. As they are walked on a dual leash, he has no choice but to keep up with her as she bounds along and then stops for pats. He is learning to accept pats from strangers, while Freya expects pats as her right. Freya is loving her new home and family and looks forward to many happy years in Nova Scotia. 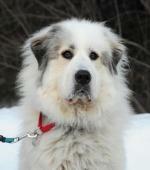 Our thanks to Freya's new family for making this Great Pyrenees Rescue story a wonderful success. We have an update on Freya and her dog adoption story. Her new human partners were kind enough to send us a note and a picture to show how well she is doing. We knew that in the right home she would flourish. "Hi. We are Freya's new care takers.We just thought you might enjoy an update. Freya is doing very well and is steadily gaining weight. Her coat is rapidly improving as well. That is probably due to all the pats she gets from everyone. She has already won many hearts in the neighbourhood and will undoubtedly continue to do so. She is truly an Angel. Thank-you so much for allowing us to include her in our family. Her brother Loki is taking very good care of her. He washes her face and feet when they come in from the snow. It is too cute. Take care, Grant, Cheryl, Loki and Freya"
We have moved to Rothesay, New Brunswick and Freya is doing very well. She didn't mind the move at all and has settled in with her brother Loki. They both are enjoying their new fenced yard overlooking a lake. The ducks and geese are keeping them both amused. Freya has matured to be a wonderful, (105-110 pound) companion. She has the sweetest disposition and is loved by all she meets. We were so very lucky to be chosen to care for her. Thank you, for all you do for this wonderful breed of dog. Would you like to help us? You can use your Credit Card or Paypal to make a donation to support our rescue work. All donations are greatly appreciated… no matter how small. 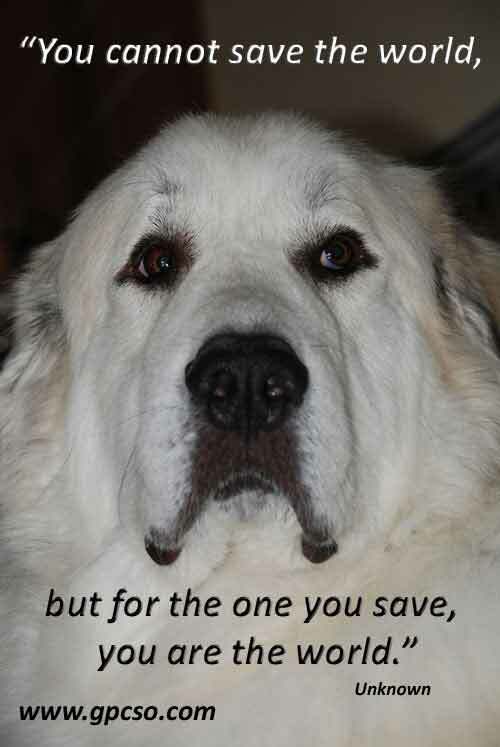 You can be assured that every penny goes to support our rescued Great Pyrs. 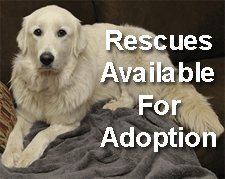 Why not check out another successful Great Pyrenees Rescue Story.